A double dose of Rockman EXE music news today! We've got the packaging and full track list to both the Sound Box and the highly anticipated 15th Anniversary Arrange Best Track. Read on for the details! First, the sound box. The package design (by Ryuji Higurashi) has been finalized. The set includes six discs of music from the EXE series. 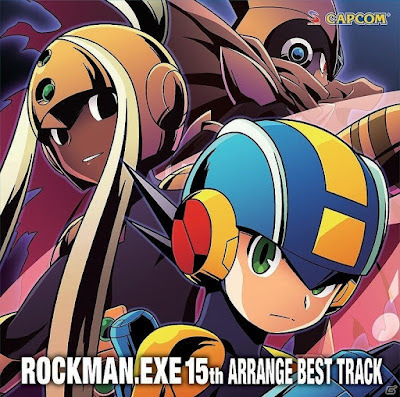 According to the Rockman EXE Zone, the track listing comes from previous EXE OSTs, repackaged (Rockman EXE Game Music Complete Works – Rockman EXE 1~3, Rockman EXE Game Music Complete Works – Rockman EXE 4~6, and Rockman EXE 5DS & 6 Music Encyclopedia). The sixth disc actually includes Battle Chip GP and N1 Battle's OSTs. This is the first time both games' music are being published on CD! Check out the full soundtrack listing here. On the arrange OST front, the musicians have been revealed. We've got Akari Kaida, Yasumasa Kitagawa, Masahiro Aoki, Yoshino Aoki, and Toshihiko Horiyama. All these artists have contributed to the series in some form. Tracks 12 and 13 are actually bonus tracks pulled from two previous, non-EXE albums: Capcom Special Selection: Rockman Xover and the second from We Are Rock-Men! 2. Both the Sound Box and Arrange Best Track are available for pre-order on Amazon Japan. Pretty solid list overall, would've loved to have seen a bit more out of 5 and 6, but this is still pretty great. Can't wait for Fire Field! Neat. Hope the remixes themselves are good... They picked pretty good songs. Ooooh Surge of Power!+Arranged+Yoshino Aoki=OMG YESSSSS I WIN AT LIFE! The of ROCKMAN EXE 4 by Toshihiko Horiyama = Biggest meh of my life. But Masahiro Aoki didn't you already arrange vs.Nebula Grey bro? Ahhh I love it anyway, the Xover one was beastly but a little short. Where is Shinji Hosoe? I like the box it is less lazy than the copy paste they did for RMX. I can't contain my hype. Running Through The Cyberworld is the School network theme from BN1. Basically Number Man Stage. You're right, I probably forgot it because it is basically the main them remixed. I make it a point to forget themes that are suppose to be unique but are heavily reliant on the main theme. Also if what they say about Rockman EXE 5DS & 6 Music Encyclopedia being repackaged is true... More disappointment, since that is missing EXE5DS tracks, a good portion of them actually. At least throw in Legends&Phantom of the Network. My hype is dwindling for the Sound Box. I agree with you completely! It's outrageous they could release this and not have all of EXE5DS and just lazily take what was from EXE5DS&6 Music Encyclopedia and reorder the tracklisting. As happy as I am to see a Arranged CD for EXE, I'm not looking forward to this Sound Box at all. 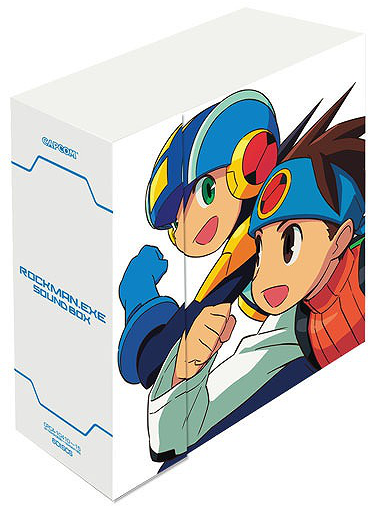 There's just nothing that exciting to it, no new tracks like the X or Rockman Sound Box 2 had. Also, at the end of the day. Who really cares for N1 Battle and Battle Chip GP? They could have used that last disc for something more worthwhile, the rest of EXE5DS, EXE Transmission and the cell phone games like you've stated, and even Battle Chip Stadium. Even some of the EXE1DS could have been added. What's next? An SSR Sound Box with one extra disc for SSR3? How about a Dash Sound Box that's done that same way. Maybe half the tracks would be cut since they couldn't all fit on one disc? Maybe we'll get a Zero Sound Box where they just take Game Music Complete 1~3 and just add Zero 4 that could possibly sound worse than that release. Yup, Arrange Best Track>>>Sound Box. Theme of Rockman.EXE? Thats no the same "Running Through the Cyber World", or is a Midley for all the themes?